Do I have your trust? The answers often are not the same. And yet marketers often conflate them. Grabbing a consumer’s attention for any length of time is seen as a proxy for “engagement.” And “time spent” is equated to the depth of trust of the brand by a consumer. Of course, this is just not true. (N)othing is as fast as the speed of trust … In a high-trust relationship, you can say the wrong thing and people will still get your meaning. In a low-trust relationship, you can be very measured, even precise, and they’ll still misinterpret you. And then there is the zero moment of truth made famous by Google – when a person grabs a laptop, mobile phone, or other wired device to start learning about a product or service they’re thinking about trying or buying. But, the truth is no single “moment of truth” exists for any of those human decisions. Depending upon the context of the question the consumer is asking and the product or service desired, hundreds or thousands of cumulative moments of trust influence how (or if) there is a moment of truth at all. To satisfy any moment of truth, marketers attempt to target messaging in earned, owned, and paid media to raise awareness of a provocative question (e.g., how do you get your shirts so clean?) or provide the answer to the consumer’s known question (e.g., I get my clothes clean by washing them in XYZ soap). But the consumer’s level of acceptance – or skepticism – to the question and the answer depends on their level of trust of the brand. And trust is cumulative, not based in any one moment. Trust is our goal as content marketers. Wherever the moment of truth falls on the customer journey, we want the fastest and deepest acceptance of our proposition as possible. Put simply, our job is to have to spend less on attention and receive more intuitive action. Think about it. Why have we marketers historically advertised in one publication over another? The simple but incomplete answer is that’s where the target audience is. But the more important reason a marketer chooses one media brand over another is because of the trust their audience has in that media brand. We want that same halo around our brand. We live in a world where we now can create that trust and where the bar of trust in media brands is low. Put simply – in varying degree – we no longer need the media to create that familiarity and trust for us. 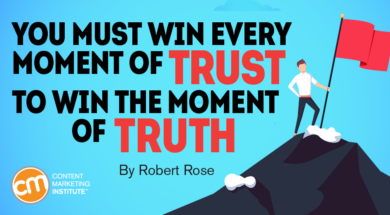 Every digital experience we create should not only reflect our focus on winning a moment of truth – where the customer is paying attention – but in deepening the trust gained (or regained) in every step that precedes or follows it. We can look to four elements in an approach to build this trust and familiarity with our audiences. Trust is proportional to the risk taken. As marketers we should gauge what we ask in relation to the perceived risk the audience could have. A classic example of this is the decision to gate white papers in a resource center. Attention is high (the visitor wants the asset), but trust is low (the visitor is unsure of what the source will do with his or her information). Because of the perceived risk the visitor provides bad data. We worked with a software company that assessed the perceived risk and changed its white paper program. Abstracts of the white papers were made accessible to all. Then, the company implemented a progressive-profiling model to ask only for information when it was needed. And at each stage, the company explained why the information was needed and what would happen with it. Here’s the kicker. Conversions went down by 25%, but the quality and quantity of data within registrations went up by 50% – and the level of trust among its resource center subscribers was high. One of the biggest attributes of building trust is creating consistently valuable experiences. In other words, it’s not only about developing extraordinary things that are valuable, but about the little things that frequently deliver reliably over time. We must be familiar to our targeted audience if we want its trust. In psychology, this is known as the exposure effect. In experiments, the subjects were found to have more trust in people they saw walking down the street than those who they didn’t see. Content marketing is a huge tool in the exposure effect. In one example, consumers read a piece of educational content provided by a brand. They were asked about their level of trust in the brand immediately after reading it and again one week later. Interestingly, the number of customers who identified the brand as “trustworthy” one week later jumped 14% (9 percentage points). Being trustworthy is more than being appropriate or relevant. Trust is deepened as hidden, personal value is uncovered without having to ask for it. Our audiences feel like they are truly understood. Personal is different than “personalized.” The value of being personal isn’t customizing a mailing label or email field to address a prospective customer by name. In fact, delivering personal value may not be personalized at all. A wonderful example of this is a large financial services company that we worked with. Like most institutional firms, they target high-level financial advisors. Also, like most firms, they have a quarterly and yearly outlook report to illustrate their thought leadership and point of view on the market. Many of their competitors distribute their reports to advisors through a personalized emailing featuring the recipient’s company name. Our client did something different. It customized the front piece in each report. It created personal letters to each advisor, based on what it knew about the advisor, and (when appropriate) sent only the sections of the report most pertinent to the advisor’s business. The key, of course, to delivering personal value is to know what it is. This means that the usual scraping of data or inferring conclusions based on interaction with digital content is going to be ripe with distrusted data. The best way to get data that can be trusted by your brand is to deliver that personal experience that encourages the audience to willingly and trustingly give its information to the marketer. Understanding the ability to dazzle gradually means that we must look at trust as a cumulative investment of experiences that can be wiped out at a moment’s notice. We must move from a touchpoint mindset to a journey mindset. In a customer-touchpoint mindset the marketer seeks to ensure that an audience will be satisfied with each interaction with the brand’s content. While this may hold the customer’s attention, each touchpoint does little to deepen trust. To elicit a deeper trust, each experience must be able to adapt in the present to what happened before and what will happen after the interaction. A classic B2B example of this is the handoff of leads from a thought leadership platform to the sales team. In many companies we’ve worked with, a salesperson has no idea which content a new inbound lead interacted with. Subsequently, the salesperson treats the prospect as new to the ideas the company puts forward. And, in fact, this can ruin both the relationship between the customer and the content, and between the prospective customer and the salesperson. If this New England mystic had been a marketer in our day, she might have said, “Don’t hit customers with your content and your brand in one big, forced flash, or you’ll blind them. Don’t miss Robert’s unique insight and fresh perspective at Content Marketing World Sept. 4-7 in Cleveland, Ohio. Register today and use code BLOG100 to save $100.